The book arrived in Honolulu by ship from San Francisco on New Year’s Day, 1863, and soon caused a stir throughout the city. It begins by revealing the author’s intent to allow his colleagues “to see themselves as others see them” so that “in all their underhanded dealing, they may hesitate.” The slim volume offers bracingly frank descriptions of 31 leading Honolulu merchants, in terms that border on slanderous. 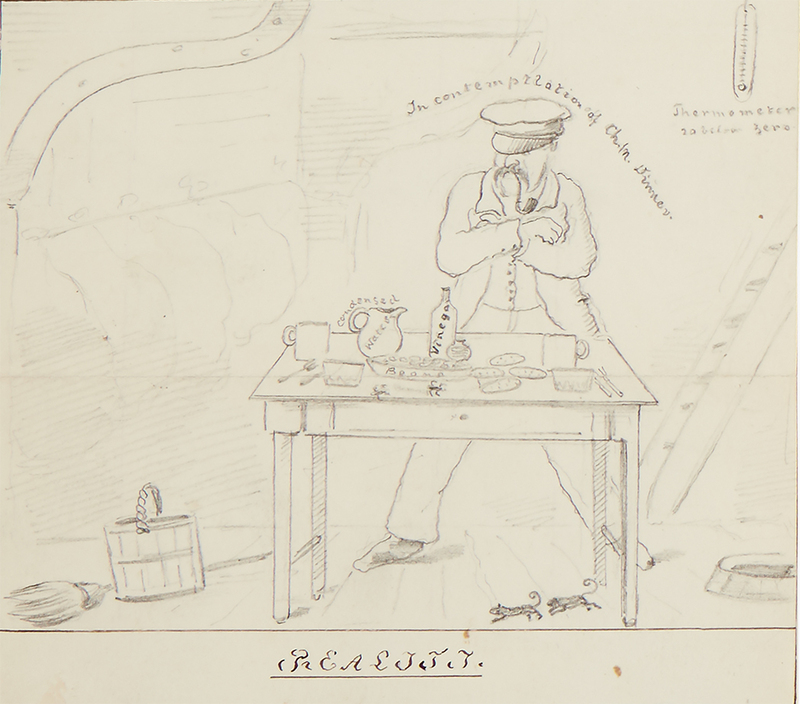 Issued anonymously and distributed to its subjects in the dead of night, The Honolulu Merchant’s Looking-Glass remains one of the great curiosities–and rarities–of Hawaiian literature. One of only two known first editions is among the more scandalous highlights in our September 28 auction of Printed & Manuscript Americana. 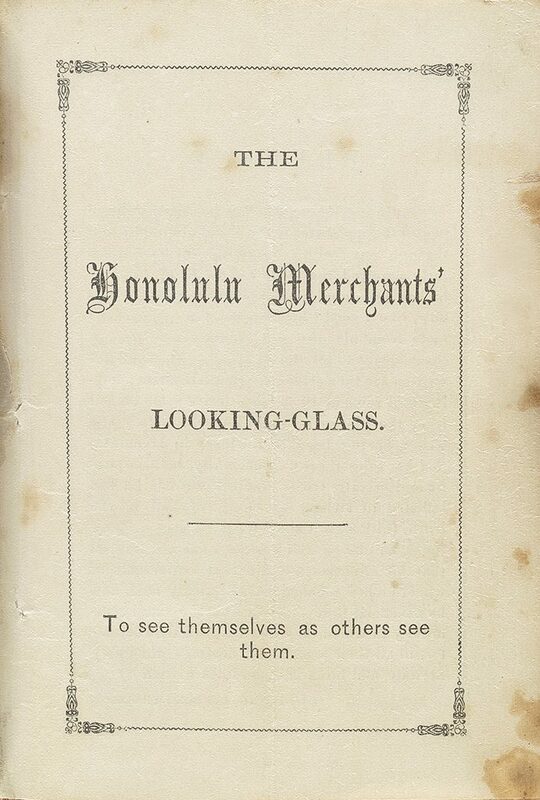 Lot 126: The Honolulu Merchants’ Looking Glass, first edition, San Francisco, 1862. Estimate $6,000 to $9,000. 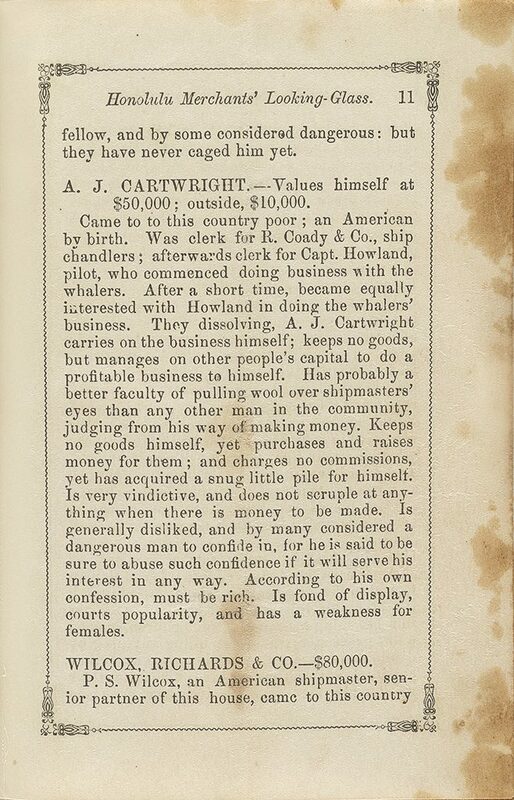 A typical page from The Honolulu Merchants’ Looking Glass. The provenance of this copy is significant. It was originally owned by Honolulu merchant Charles Lewis Richards, a partner in the mercantile firm of Wilcox & Richards. According to a 1913 note attached to the only other known surviving first edition, “this booklet was published by P.S. Wilcox of Wilcox & Richards. . . . At the suggestion of Wilcox it was written out by Widderfield, printed for Wilcox in S.F., sent down on the Comet and Wilcox delivered it in person at night by placing a copy at each doorway in town.” This, then, would be the copy belonging to the instigator’s business partner. 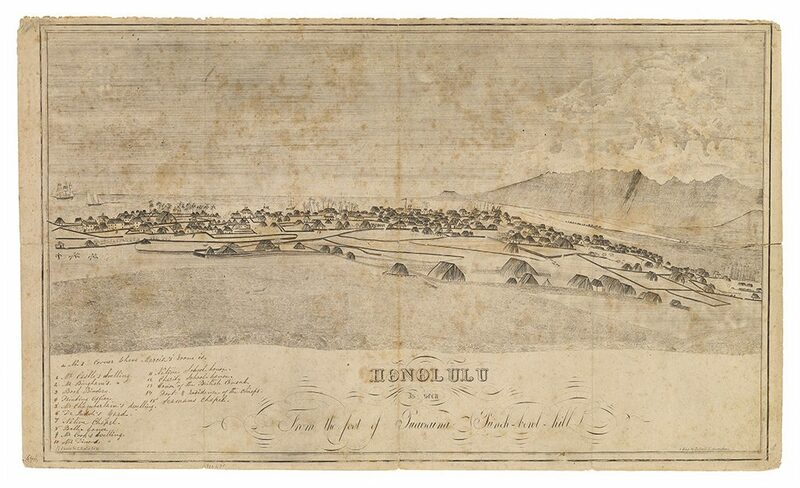 Edward Bailey & Samuel P. Kalama, Honolulu as seen from the foot of Puawaina, Punch-bowl hill, engraving with contemporary manuscript notes, 1837. 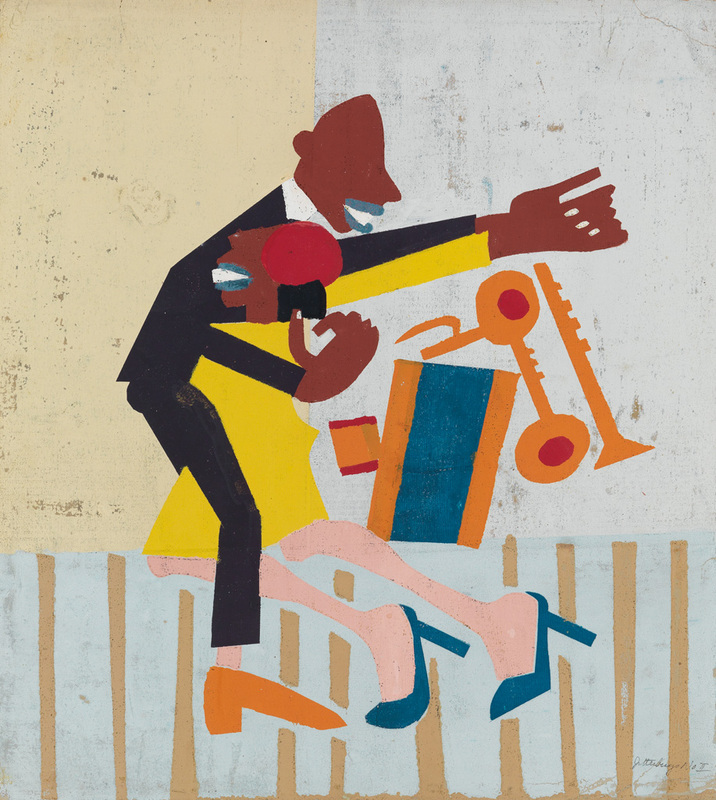 Sold May 19, 2015 for $70,000. The only other surviving copy of the first edition is currently in the collection of the Hawaiian Mission Children’s Society Library.